efforts by contributing to this year's fundraising campaign. Coastal Prairie Partnership (CPP) is a 501(c)(3) nonprofit institution. Your generous donations are tax-deductible. We invite you to support the critical work of CPP by contributing to our 2016 Prairie Fire Campaign. Help us spread the praire movement - be the spark!. Simply use the tab below to select a donation level and make a contribution to collaborative conservation action today or send a check to Coastal Prairie Partnership, P.O. 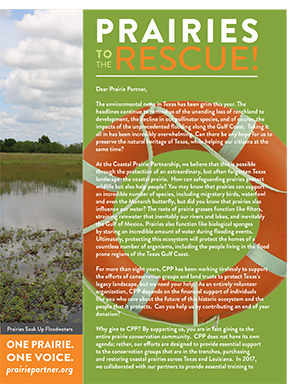 Box 540342, Houston, TX 77254-0342.
or click here to download a Prairies to the Rescue fundraising campaign letter and donation card and mail to Coastal Prairie Partnership, P.O. Box 540342, Houston, TX 77254-0342.